If you click on the thumbnail or the link below the thumbnail, the corresponding slide page will be opened. You can download this free program from the software download page of my website. The current version can make Maps for albums made with the PhotoSwipe skin, the Slide Show 4 skin, the FancyBox skin, the Turtle skin (only if check-box 'Make slide pages' on the jAlbum Pages settings is cleared) and the Tiger skin. On request I can extend this program for other skins, but only for skins generating responsive single-page albums and GPS locations support. Prerequisite for the generation of a map is that your pictures contain GPS information and you enabled the location display on a slide page. View an example of a generated map with Google Maps or Google Earth. These maps show also the tracks generated by a GPS. 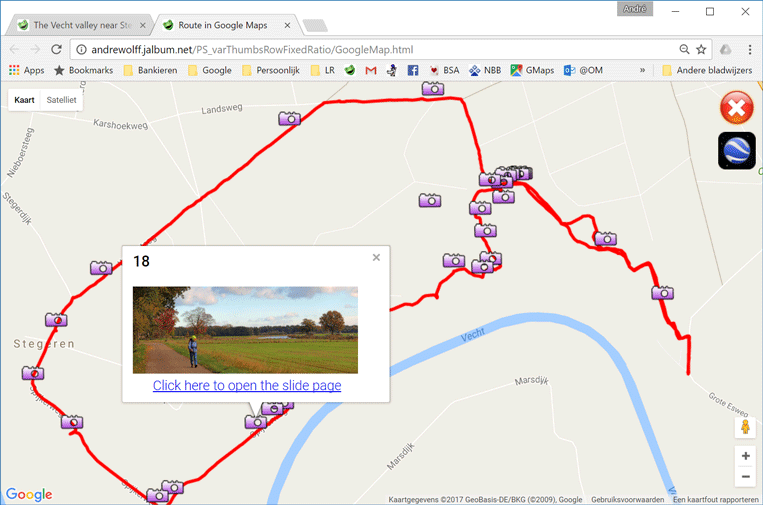 These tracks are added via the Google Earth program after the conversion of the gpx-tracklog file to a kml-file with my program ConvertTrack. You should make a link to this map from the index page as you see here for the PhotoSwipe skin or here for the Turtle skin. With The Turtle / Tiger skin you can do that with the Custom link on the Site / Footer tab and with the PhotoSwipe and Slide Show 4 skin you can enter the link on the Links tab. This program is based on the same function as available in my EditPhotoInfo program, but in this implementation is the GPS information fetched from the html or js file generated by jAlbum, so with jAlbum version 14 it can also be used with original DNG and TIFF files. For more information view the Helpfile. The new version 1.0.6 supports now too the Tiger skin, see this album. The new version 1.1.2 supports now too the FancyBox skin, see this album.